The software enables sales teams and marketers to group or segment their target audience based on custom criteria such as their landing page URLs, browsed URL history, and location among others. PushEngage then helps users create personalized notifications according to the segmentation results, leading to higher click rates and lowering the number of subscription cancellations. PushEngage makes it easy and efficient for you to target your users with powerful, personalized notifications that can be delivered even when they are not on your site. Customized push notifications help you reach your customers with messages that they can easily relate to, such as promotions, product launches, and more, encouraging them to go back to your site and improve repeat users as well as traffic. 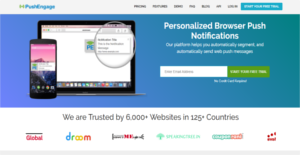 With PushEngage, you can increase your website’s notification rate by as much as 20%. The software comes with an optimized single step opt-in that your visitors can use to easily register and subscribe to your products and services. Push notifications have higher click rates compared to emails. With PushEngage’s personalized push customization messages, you will see your click rate improve three to ten times higher than before, improving incoming traffic, boosting repeat users, and enhancing your sales significantly. While most push notification platforms require users to invest in a mobile app so they can reach their mobile users, PushEngage does not. It supports popular browsers Firefox and Google Chrome, both their desktop and mobile versions. That means your push notifications can reach your users via their mobile browsers, enabling you to build your customer list, nurture your existing clients, and grow your business. What Problems Will PushEngage Solve? Cart abandonment issue: Cart abandonment is a common issue among many e-commerce businesses. While many send cart abandonment emails to reach out to their customers, many of these emails end up unopened. Web push notifications have better view rate (up to 90%). PushEngage helps businesses bring their cart abandonment cases down with its personalized push notifications sent to users via their desktops and mobile devices that they actually read. Targeted Breaking News Alerts: Media and news companies naturally want to keep their large audience updated via breaking news alerts. PushEngage provides them with the perfect platform to create and send targeted news alerts to a specific audience. Its segmentation capabilities allow them to create news alerts for a specific demographic, thereby increasing readership and subscription. Cross Promotion: E-commerce businesses that engage in a niche market naturally want to venture to other markets via cross promotion. PushEngage can help create and implement effective Cross Promotion campaigns by creating a list of products that complements other products. The platform then sends this list of complementary products to users who purchase specific items that are related to the products the user is promoting. Since each enterprise has specific business requirements, it is advisable for them to abstain from searching for a one-size-fits-all ideal software application. Needless to say, it would be pointless to try to find such a system even among popular software applications. The clever thing to do would be to list the various essential factors that need consideration such as key features, budget, skill levels of employees, company size etc. Then, you should do your homework thoroughly. Read some PushEngage reviews and look into each of the other solutions in your shortlist in detail. Such exhaustive groundwork can make certain you reject ill-fitting systems and choose the system that offers all the features you require for business success. We realize that when you make a decision to buy Mobile Marketing Software it’s important not only to see how experts evaluate it in their reviews, but also to find out if the real people and companies that buy it are actually satisfied with the product. That’s why we’ve created our behavior-based Customer Satisfaction Algorithm™ that gathers customer reviews, comments and PushEngage reviews across a wide range of social media sites. The data is then presented in an easy to digest form showing how many people had positive and negative experience with PushEngage. With that information at hand you should be equipped to make an informed buying decision that you won’t regret. What are PushEngage pricing details? What integrations are available for PushEngage? The best is Drip campaigns and segmentation as it helps us to reach the customer with their exact need. If you need more information about PushEngage or you simply have a question let us know what you need and we’ll forward your request directly to the vendor.